Luxer1 easy fit LED Roomlamp / Dome light / Dome Lamp, the best quality light for your premium car. Before you purchase, please refer to our Luxer1 LED Roomlamp guide (MY version) open and read the file with Adobe Reader. 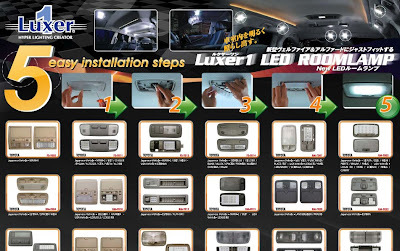 You may download Luxer1 LED Roomlamp guide for future reference by "right click" and "Save As". You can purchase Luxer1 LED Doomlamp from TJM Products. Any enquiries can contact us via email or phone call (within Malaysia). We sell premium car accessories. Car fragrance and much more than you can imagine, just like a kaleidoscope, you will see the different. Go visit TJM Products and explore more. "Car - I love you".